Fisheries have large impacts on the Gulf of Maine (GOM) and Bay of Fundy regional economy. Although the harvest is the most visible aspect of any fishery, land-based support industries are equally important. These include boat building, electronic development, and gear production for the fishers. In addition, individuals are employed in transporting and processing the harvest. In this way, the fishery underscores how important these interconnected economies are to the region. The Gulf of Maine watershed supports a long history of human activity. Early indigenous people used the waters and land for sustenance and cultural needs. Europeans began arriving in the early 1600s. As more people settled within the region of the Gulf of Maine, their presence and activities had increasing influence on the natural environment and resources around them. Through these activities, the population has become woven into the region’s ecosystem. The Gulf of Maine coast is home to more than nine million people and is prized for its beauty and abundant natural resources. Understanding the impact of human-induced alterations and sources of contaminants present in the region is complex problem. The fact sheet provides an introduction to the contaminant indicators selected by ESIP – blue mussel tissue chemistry, sediment toxicity and chemistry, and percent of beds allowed by the shellfish sanitation program. Through the combined efforts of the aquatic habitats subcommittee, data providers, design team and ESIP Steering Committee, we’ve completed the Aquatic Habitats Fact Sheet. 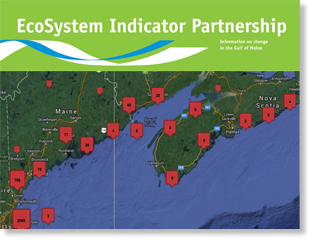 The fact sheet provides an introduction to the aquatic habitats indicators selected by ESIP – eelgrass, salt marsh, and tidal restrictions- along with a snap shot of the indicator data. Climate change is anticipated to have wide-ranging effects on many elements of the Gulf of Maine region, including its ecosystems, habitats, and coastal communities. The Earth’s climate system is driven by several factors, including the amount of incoming sunlight, volcanic activity, land use changes, and the atmospheric concentrations of greenhouse gases and other pollutants. The aquaculture industry has had a home in the Gulf of Maine/Bay of Fundy for decades, with oyster sites cultivated in Nova Scotia for nearly a century. In its current form, the industry began in the 1970s. Despite its importance to local economies and debated impacts to the environment, the roles of the numerous agencies that monitor sites are difficult to identify and understand as is the true density of aquaculture in the region. 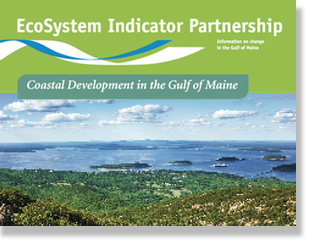 The Gulf of Maine Council’s EcoSystem Indicator Partnership (ESIP) was created in 2006 to assess the health of the Gulf of Maine. 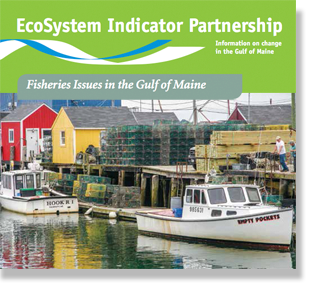 This introductory fact sheet describes the process used to select appropriate indicators for looking at change in the Gulf of Maine/Bay of Fundy. The harvest of American lobsters is the Gulf of Maine’s largest, most valuable, and most iconic fishery. The catch has never been higher, but how long will it last? Fishing communities in eastern Maine and southern Nova Scotia are seeing historically high landings, some five times higher than the 1980s. At the same time, the lobster fishery south of Cape Cod has all but collapsed, plagued by shell disease and stressfully warm summers. It has never been more important to monitor this vital fishery. 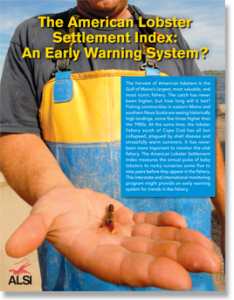 The American Lobster Settlement Index measures the annual pulse of baby lobsters to rocky nurseries some five to nine years before they appear in the fishery. This interstate and international monitoring program might provide an early warning system for trends in the fishery.